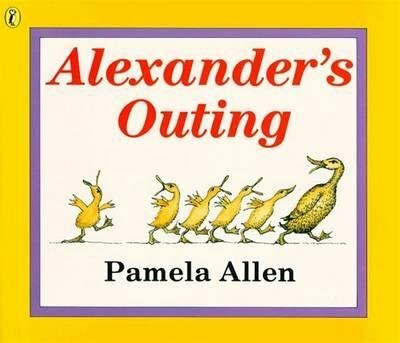 Alexander’s Outing follows a duckling who always seems to straggle behind even with his mother’s warning to stay close. Alexander lands himself in a bit of trouble when he falls down a deep dark hole. Lucky for him there is a very kind group of people who make a plan to rescue him. This story emphasises the importance of always listening to the group leader and staying close to the group. The rhythmic text makes Alexander’s Outing a delight to read aloud. There are many basic concepts that can be targeted in this book, but it is particularly good for working on prepositions. The ducks walk past a bottle tree, through some gates, and along a road. Then little Alexander falls down the hole and the people work together to get him up and out! Although not mentioned explicitly in the text, the illustrations lend themselves to a teaching moment about the concepts of floating and sinking. Alexander’s Outing is also a great choice for targeting the higher level semantic skills, such as describing means to a goal (i.e. how can they get Alexander out of the hole?) and obstacles to an action (e.g. why can’t the man reach Alexander? ).